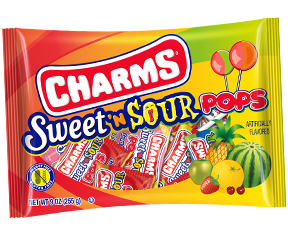 Covington, TN - Charms Sweet 'N Sour flat pops now have a new package! We also added some new flavors: cherry 'n sour apple, blue razz 'n watermelon, mango 'n tangerine, strawberry 'n lemon, and pineapple 'n grapefruit. Try them today!